Point to Point Delivery Service within 4 to 6 Hrs By the Mumbai Startup Teen. The Logistic Effort of a 13 Yo Mumbaikar teen brings point to point delivery service through Paper and Parcel startup. Youngest Successful Entrepreneur - Paper and Parcel courier service MUMBAI. We all were full of energy and enthusiasm during our school days but very few of us used it positively. So, today we are going to cover the story of a smart and dynamic schoolboy who will be the inspiration for the generations to come. We are talking about Tilak Mehta - a teenager with an inquisitive mind! At the age of 13, this boy from Mumbai founded a company called Papers and Parcels which is currently a revolution in the logistics industry. 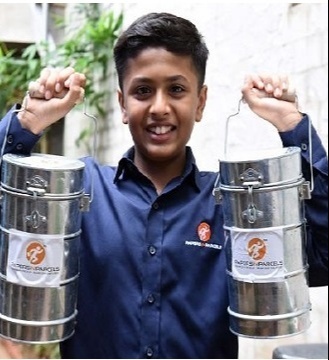 Tilak Mehta is a young 13-year old budding entrepreneur from the city of dreams - Mumbai. Also, he is the student of Garodia International School, Mumbai. The idea of Papers and Parcels came to his mind when he was studying in class 8th. What Service Do Papers and Parcels Deliver? Papers and Parcels is a company who provides the doorstep pick-up and drop off delivery service in the Mumbai City. The USP on which the Papers and Parcels are working is one-day delivery i.e your product will be delivered within a day from its pickup time (mostly takes 4 to 8 hours to deliver). The Company Papers and Parcels operates on a simple mission that is "Make your life easier no matter you’re our delivery partner, a Dabbawala or a loyal customer". The mission is quite plain but a difficult one to achieve. Inspiration Behind "The Papers & Parcels"
Tilak is a resident of Mumbai. His father Vishal Mehta was the chief executive of a logistics company. He told that the idea of doing business has come from his father. He needed a lot of books from the other end of the city and his father comes tired from work. Hence, he could not speak to him to get those books. Also, there was no other such person who could have been asked to do so. In the meantime, the idea of a startup came to his mind. Why not start something which can deliver papers and small parcels in one day. After this, he discussed his idea with his father and then it was the start of his business which now is one of the most successful startups. Tilak said, "Papers and parcels is my dream. And I will work with my full efficiency to increase it." The company, Papers, and Parcels is primarily based on mobile applications, which has more than 200 employees. 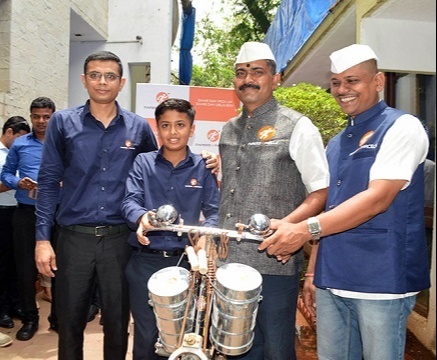 Apart from this, more than 300 Dabbawalas are connected to the company through which the company delivers around 1200 parcels daily to its destination on the same day. The company accepts parcel up to a maximum of three kilograms and charges 40-180 rupees according to the weight. Basically, they deliver their products i.e. Papers and Parcels with help of Dabbawalas. Ghanshyam Parekh, who became the Chief Executive of Paper & Parcels, said that at present the company pays a pre-determined amount to each Dabbawala. However, later they are considered to be paid according to the delivery. He said that presently customers such as Pathology Labs, Boutique Shops and a Brokerage Company are taking their services the most. Hence, their business is also expecting to grow in other fields as well. He hoped that after the formal launch, the company will have 20 percent partnership in the Intra-City Logistics market in Mumbai and Rs 100 crore by the year 2020. When it comes to doing something new or Unique, the most important thing you need is- Your Family Support. Tilak Mehta is traveled all along this way of success because of his family support. His father and the core team of PNP used to work together, Tilak's mother coordinated his studies, sports, and business very effectively. Tilak's family never stopped to travel him with Dabbawalas in order to learn their process of delivery. He traveled for 15 days with them. And that's how this most important factor made him one of the biggest businessman of India!